'Tis the season for chocolate covered strawberries, hearts on everything, pink & red, hugs & kisses. Orrrr...'tis the season for all that annoying lovey-dovey crap. Regardless of your mindset, if you're in a relationship or single, Hangin' with the girls or hangin' with your cats, Valentine's should be handled the same way... With cake! While chocolate cakes are not my personal first choice, when it comes to cake requests in February- chocolate trumps all. And when I think of a Valentine's Day cake, this cake here is what pops into my head. 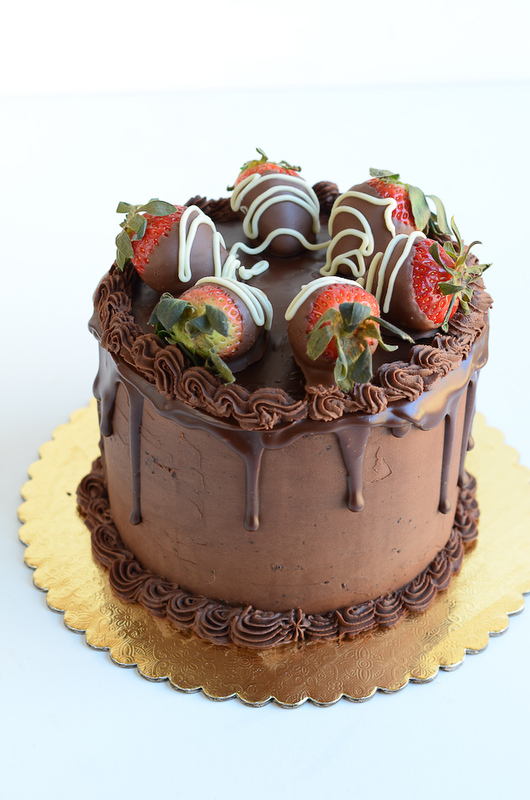 I know putting chocolate covered strawberries on top of a chocolate layered cake isn't the most original idea, but I think this is the type of cake that will never be dated. It's simple, classy, & elegant. 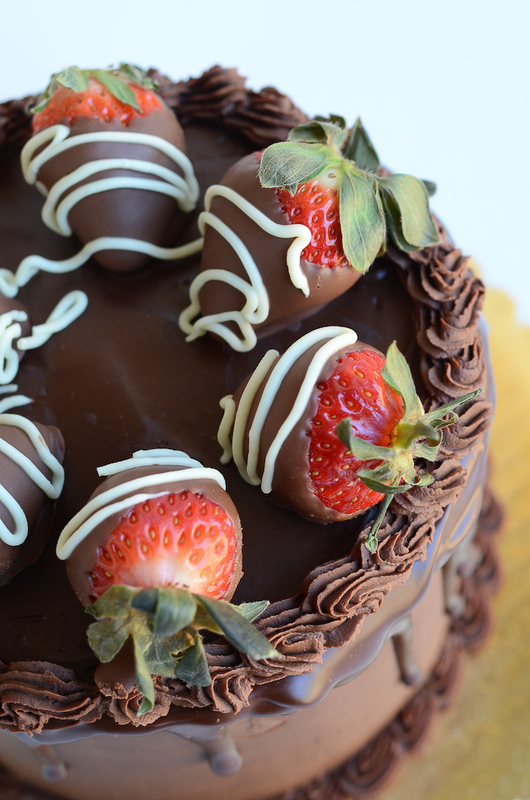 And whether you're a sweets person or not, chocolate covered strawberries are always tempting! This cake is made up of moist chocolate cake layered with ganache and all wrapped up in a smooth chocolate buttercream frosting. 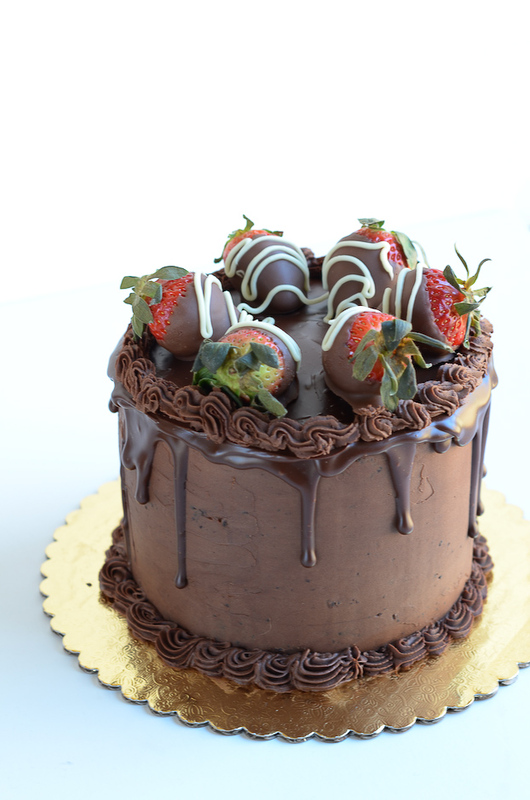 Then topped with milk chocolate covered strawberries. Like the name says, a Chocolate Lover's Dream Cake. Oh and.... Happy Galentine's Day, Ladies!! Treat Yo Self! Preheat oven to 350. Line pans with parchment paper and grease/flour. Melt bittersweet & semi-sweet chocolate in a double-boiler. Beat butter, sugar, and vanilla on medium-high speed until light & fluffy-minimum of 3 minutes. Add eggs one at a time until well combined. Add melted chocolate. In another large bowl, sift together flour, cocoa, baking soda, baking powder, and salt. Alternating with the dry ingredients and the buttermilk, add each to the butter mixture starting and ending with the dry ingredients. Slowly add hot coffee, mixing until combined. Distribute among pans evenly and bake for 28-30 minutes or until a toothpick inserted in the middle of the cake comes out with a few crumbs. Cool pans on wire racks for 10 minutes. Remove cakes from pans. Once cooled, wrap in plastic wrap and stick in the freezer. This helps with flavoring and handling for decorating but is not a mandatory step. Heat whipping cream in a small saucepan over medium-high heat until bubbles form around the edge of the pot. Place chocolate in a large bowl. Pour hot cream over the chocolate and whisk until smooth and bump free. Let sit for about 45 minutes, stirring occasionally, to cool and thicken enough to use as filling. Cream together the butter and sugar. Gradually mix in the cocoa powder. Add vanilla and just enough milk to reach the consistency for easy spreading. Thank you so much, Erika!! Hope you and Eric had a great valentine's day! Chocolate with strawberry looks so sweet and yummy too!! I am glad I visited here and learned. Keep up the good work – Just love your blog.